A very work stained 7599 stands at Carnforth, towards the end of the steam era. D7599/25249 missed its 21st anniversary by just one week. Allocations included Eastern, Scottish & London Midland Region depots, with the vast majority of the time spent on the LMR. Time between last Classified repair and withdrawal: 84 months. October 1966 to Eastfield (65A) on loan. March 1972 to Liverpool Division (D08). November 1972 to Preston Division (D10). January 1975 to Springs Branch. 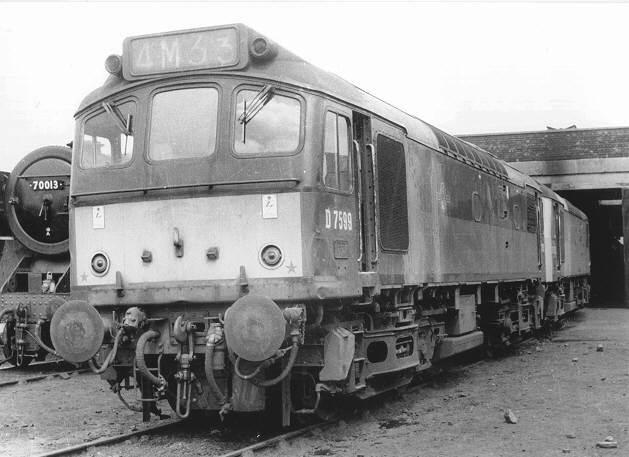 25249 was the 305th Class 25 withdrawn, one of four retired during January 1987. After withdrawal 25249 was stored at Basford Hall until sold to Vic Berry, Leicester and moved with 25199, 25244 & 25906 to Humberstone Road on June 2nd 1987 and into Vic Berry's yard the next day. It was added to the stack by October 1987 and was scrapped during the last week of March 1989. Noted Derby Works May, July - August 1974 (dual brake equipment fitted). Noted Derby Works October - December 1979 (General repair). D7599 was constructed at Derby during the winter of 1965/66, part of a batch of thirteen machines (D7598 - 7610) destined for Tinsley (41A), all were released to traffic during February 1966. In October D7599 moved north to Eastfield (65A), spending eleven months there. In September the Scottish Region swapped D7598 - 7601/11/12 for D7576 - 79/81/83/84, the latter being boiler equipped, allowing them to replace the ailing NBL types on the Glasgow - Dundee route. On May 31st 25249 & 25087 worked the 13.00 Sheffield - St. Pancras forward from Nottingham, returning from St. Pancras later that day with a St. Pancras - Sheffield as far as Nottingham. On August 7th 25249 & 25233 were noted at Crewe with a passenger train for a North Wales destination. During January 25249 returned again to Springs Branch, then it was off to Longsight in October. Photograph courtesy Mark Cook. 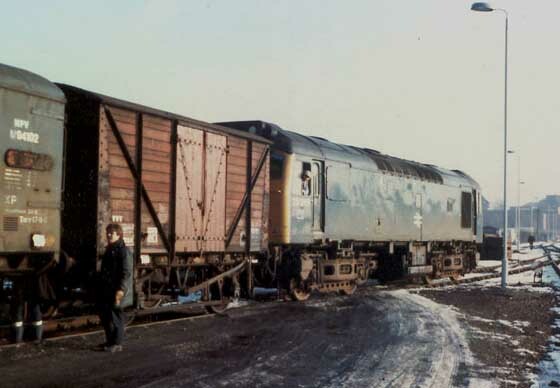 On a cold winters morning 25249 shunts parcels wagons at Aylesbury, date unknown. The 16.57 Exeter Riverside - Margam freight was worked by 25249 on October 18th. 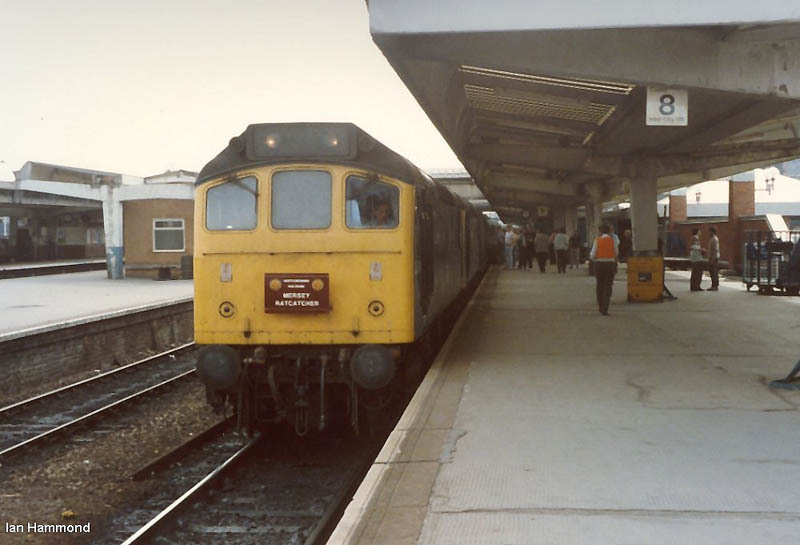 On December 3td the 19.30 Gloucester - Bristol Temple Meads diesel multiple unit failed before departure, 25249 assisted the service throughout. On July 1st 25249 & 25289 worked the relief 09.34 Leicester - Yarmouth to Norwich. On July 17th 25249 worked the 07.21 Peterborough - Spalding and the return 07.50 Spalding - Peterborough. 25249 worked a round trip Derby - Crewe relief service on August 5th. 25249 was noted at Saltley depot at noon on August 8th. Stone traffic from Mountsorrell to Kennett had recently transitioned to new, air braked high capacity wagons. The second trip on October 11th ran behind 25249 & 25301 with twenty four wagons. Further south the new GLC Freightliner Refuse Terminal at Brent received a trial run on November 8th with 25249 in charge, regular service to Stewartby commenced November 23rd behind 45045. 25249 worked a late evening Newcastle - Carlisle parcels on February 22nd. On June 30th the 10.10 Euston - Aberystwyth was worked forward from Birmingham New Street by 25249 & 25032. On July 9th the 19.37 Exeter St. Davids - Paignton was worked by 25249. About a week later on July 15th 25249 assisted the multiple unit working 07.40 Wolverhampton - Euston day excursion between Northampton & Bletchley due to the power being off for engineering work. On July 21st 25249 & 25321 worked the 08.25 Leicester - Blackpool North forward from Nottingham, returning with the 14.25 Blackpool North - Leicester as far as Nottingham. 25249 assisted two multiple units between Northampton & Wolverton during the morning of September 23rd due to the power being off for engineering work. The last Classified repair for 25249 was carried out at Derby from October to December. The 11.35 Poole - Newcastle on July 17th was noted at Sheffield behind 25249 & 25279, presumably handling the Birmingham New Street - Newcastle leg. On December 16th the 13.49 Preston - Liverpool (the portion off the 10.35 Glasgow - Manchester) was worked by 25249. Photograph courtesy Tony Sayer. 25249 keeps company at Springs Branch depot with the brakedown crane and several Class 47s on February 21st 1981. 25249 was noted with eastbound ICI limestone empties at Chinley on September 21st. 25249 was stabled at Northwich on September 28th. On November 4th the 15.11 St. Pancras - Nottingham required assitance from ?? to Leicester after 45117 failed. After arrival at Leicester 25249 was removed and attached to the 15.55 St. Pancras - Derby following the failure of 47480 which was dragged to Derby. On December 10th the 20.40 Euston - Wolverhampton was worked between Coventry & Wolverhampton by 25249. Photograph courtesy Jerry Glover. 25249 strikes a fine pose at Cockshute on February 6th 1982. On February 25th 25249 was noted eastbound through Manchester Victoria with the Appley Bridge - Dean Lane GMC waste empties. 25249 & 25287 were stabled at Bletchley on April 26th. On June 24th 25249 & 25309 were noted passing Diggle with a merry-go-round coal train. 25249 was the Manchester Victoria pilot on a damp August 24th. On September 1st 25249 & 25254 were noted northbound over the Settle & Carlisle with a lengthy train of oil tanks and one Railfreight wagon. On September 2nd 25249 was noted southbound through Hereford with a train of oxygen (?) tanks. 25249 was noted southbound at Leighton Buzzard headed for Willesden after dropping off cement tanks at Tring. 25210 & 25249 were noted at Leighton Buzzrd with a lengthy loaded ballast turn on December 5th. 25249 was noted at Northampton on December 30th. On February 22nd 25249 was noted passing Peterborough with cement tanks (for Ketton?). During March 25249 receieved an 'E' exam at Crewe. 25269 & 25249 were noted northbound through Bristol Temple Meads on March 22nd (or 24th?) with a train of LPG tanks. 25249 was stabled at Northwich depot on March 30th. 25249 arrived at Ipswich with five tanks from Langport on May 14th, 47242 took the train forward to Parkeston whilst 25249 returned light to March. On June 3rd 25315 & 25249 were noted eastbound through Chester with an oil train. Despite the increasing numbers of Class 31s available over the WCML the Bank Holiday diversion of the Euston - Aberystwyth services north of Rugby used pairs of Class 25s. The 07.35 used 25117 & 25237, the 10.10 featured 40135, due to be relieved by 25249 & 25306 at Birmingham, but instead working through to Aberystwyth. Later in the day 25249 would assist the 19.50 Shrewsbury - Euston to Wolverhampton following the failure of 47558. On June 25th a Gillingham - Welshpool charter was worked roundtrip Wolverhampton - Welshpool by 25249 & 25269. On July 30th the 14.00 Aberystwyth - Birmingham New Street was worked from Machynlleth to Birmingham New Street by 25249 & 25202 following the failure of 25119, the train being extended because of late running. 25249 was noted northbound at Banbury with bogie oil tanks on August 25th. 25249 was stabled at Shrewsbury on January 7th. 25249 was noted northbound at Cwmbran on the morning of January 18th with a ten wagon freight. In the late evening of January 25th both 25249 & 25257 failed near Roade working a Stanlow - Salfords oil train. Bletchley provided two more Class 25s and a fitter to resolve the problem, with the train finally getting past Bletchley in the early hours of 26th. 25249 was noted light engine at Manchester Victoria on March 20th. 25249 was noted at Healey Mills on March 28th. On April 10th 25249 was noted eastbound at Manchester Victoria with a long train of empty mineral wagons. The Ditton - Broughton Lane BOC tanks continued with its familiar pair of Classes 25 & 40, so noted were 40196 & 25254 (April 28th), 40155 & 25059 (May 5th) & 40001 & 25209 (May 15th) whilst an extra working on April 29th produced 25249 & 25262. On May 23rd 25296 & 25249 worked the 6V32 Ellesmere Port - Cranmore bitumen tanks. On June 16th 25249 & 25303 worked the 07.44 Shrewsbury - Aberystwyth, returning with the 10.10 to Euston as far as Shrewsbury. The next day (17th) the same pair worked a roundtrip Nottingham - Llandudno Town charter, routed via Chesterfield and Manchester. On June 23rd 25249 & 25284 worked the 07.44 Shrewsbury - Aberystwyth, returning with the 10.10 to Euston as far as Shrewsbury. On June 30th the 10.10 Euston - Shrewsbury worked forward from Wolverhampton with 25249 & 25259. A relief Holyhead - Euston on July 9th was worked to Crewe by 25249. On July 14th 25249 was noted at Euston station. 25315 & 25249 were noted passing through Nuneaton with bogie oil tanks on August 13th. A working once familiar to the Class 25s was seeing a greater use of other classes, the 18.12 Manchester - St Pancras parcels, as far as Derby. 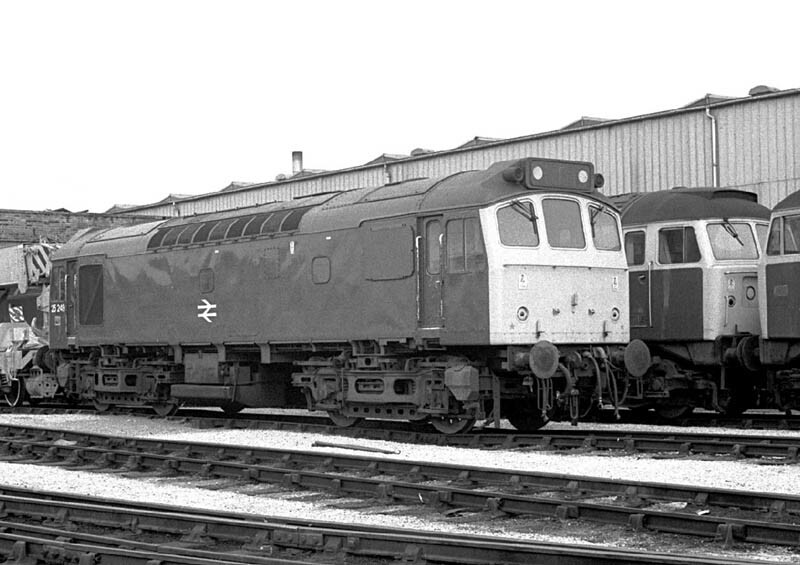 Noted during August were 25185 (1st), 25316 (20th) & 25249 (22nd) as were a number of the fast disappearing Class 40s. On September 5th 25249 was stabled at Saltley. 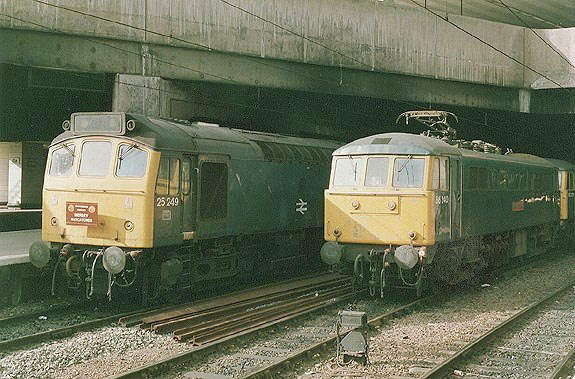 On September 15th 25249 & 25269 worked the 10.10 Euston - Shrewsbury forward from Wolverhampton. On September 21st 25249 was noted at Nuneaton with a loaded ballast train. Between November 6th & 8th 25249 was active on the Settle & Carlisle banking northbound services between Settle & Blea Moor, including the 07.38 Hull - Carlisle (6th, 7th & 8th) and the 15.55 Leeds - Carlisle (7th). Additionally on the 8th 25249 assisted 31434 throughout on the 15.52 Lancaster - Hull. On November 11th 25249 was stabled at Skipton. On December 8th 25249 worked a short Stoke on Trent - Peterborough parcels. 25249 worked the afternoon King's Cross - Tring cement empties on January 23rd. Not only were the Class 25s fading fast but some of their long-standing traffic flows were also disappearing. Thus it was left for 25249 to handle the last London Brick Company 'Fletliner' on January 25th, the 4F53 12.40 Stewartby - Garston brick train. Traffic formerly sent to Kings Cross, Trafford Park & Garston now moved by road. On February 23rd a shortage of electric locomotives found 25249 & 25303 in charge of the early morning Ditton - North Wembley BOC tanks. The Class 25s also worked the northbound empties. On May 4th a diverted early morning Willesden - Coatbridge freightliner was noted through Newcastle behind 25249 & 25259. Two days later (6th) the same pair passed through Huddersfield on oil tankers. On May 13th the 08.05 Liverpool - Newcastle required the assistance of 25249 between Edge Hill & Manchester Victoria following the failure of 47162. 25249 & 25311 were noted at Toton on August 17th. On September 5th 25249 was noted at Stafford with an engineers train. The 18.15 Glasgow Central - Manchester Victoria was worked from Preston by 25249 on October 6th. The 06.30 Blackpool North - Euston was worked to Preston by 25249 on October 29th. Photograph courtesy Steve Houlker. Classic traction at Preston on a very wet Sunday October 6th 1985. 25249 has charge of a parcels train whilst much water pours from the guttering of a local diesel multiple unit. On October 22nd 25249 was noted southbound at Peterborough with a freight (for March / Whitemoor?). On October 25th 25249 was noted at Trawsfynydd Nuclear siding with a flask train. On November 13th the diesel multiple unit working the 09.02 Morecambe - Leeds failed before departure requiring 25249 to assist throughout. 25249 was noted southbound at Derby with empty container flats on December 19th. On January 20th 25249 was noted at Ellesmere Port signing on point. On January 31st the 23.50 Euston - Liverpool failed at Winsford behind 47435, 25249 dragged the service to Liverpool. On February 24th the 06.22 Wolverhampton - Paddington failed at Aynho Junction behind 31424, 25249 dragged everything to Paddington. 25249 was noted at Carlisle station on May 17th with a weedkilling train. 25249 & 25282 were noted northbound at Hest Bank on May 26th. The next day (27th) strong winds brought the overhead wires down on the WCML, with a number of services being diverted. The 09.50 Paignton - Glasgow traveled via Newcastle with the leg to Carlisle covered by 25249. An unidentified Newcastle - Carlisle relief was also hauled by 25249 this day. 25249 was noted at Millerhill yard with an empty car train for Bathgate on June 2nd. 25249 was the Manchester Victoria pilot on June 7th. The 16.46 Carlisle - Hull failed at Culgaith Tunnel behind 47474 on June 25th, 25249 & 31271 dragged everything to Leeds. Another Class 47 failure, this time on July 2nd with 47447 at Chester whilst working the 18.15 Llandudno Town - Blythe Bridge saw 25249 & 25321 replace the Class 47 for the remainder of the journey. The failure of the 08.17 Holyhead - Newcastle at Chester behind 45040 on July 10th was cause for 25249 to take over as far as Manchester, where 47110 substituted. The following day (11th) 25249 was noted in charge of a block tank working on the Cumbrian coast line. On July 11th 25249 worked the 09.30 Lancaster - Liverpool from Preston and the 11.40 Liverpool - Preston. Photograph courtesy Paul Fuller. A surprise working following damage on the WCML was 25249 working the Carlisle - Newcastle leg of a Paignton - Glasgow working diverted to the ECML, May 27th 1986. 25249 was noted shunting a short train of coal wagons at Crewe station on August 20th. On September 3rd the 21.00 Euston - Fort William saw 25249 drag 87013 and the train between Warrington & Wigan N.W. due to the power being off due to overhead line damage. On September 27th 25249 was noted at Colwich with an engineering train. Four Type 2s were used on the last Class 25 hauled railtour, Hertfordshire Railtours 'Mersey Ratcatcher' (1Z30) of September 28th, 1986. The tour started in Euston behind 25313 & 25249 running as far as Birmingham International where 86237 took over for the trip to Birmingham New Street. This odd move was created due to construction at New Street closing the west end of the station making run rounds difficult. 25313 & 25249 came back on the train heading off to Leicester, Derby, and over the Hope Valley line to Manchester and Liverpool Lime Street. Here 25904 & 25910 made the short run down to Crewe, via Chester, where the original pair took up the final run to Euston via the Trent Valley line, completing a day of 447 miles of Class 25 haulage. On October 16th 25249 was noted at Wendover with an ex-works CCE crane No. 1314, possibly headed for Neasden. On November 11th the 09.48 Crewe - Holyhead failed at Prestatyn behind 47555, 25249 dragged everything to Colwyn Bay where 45052 took over. 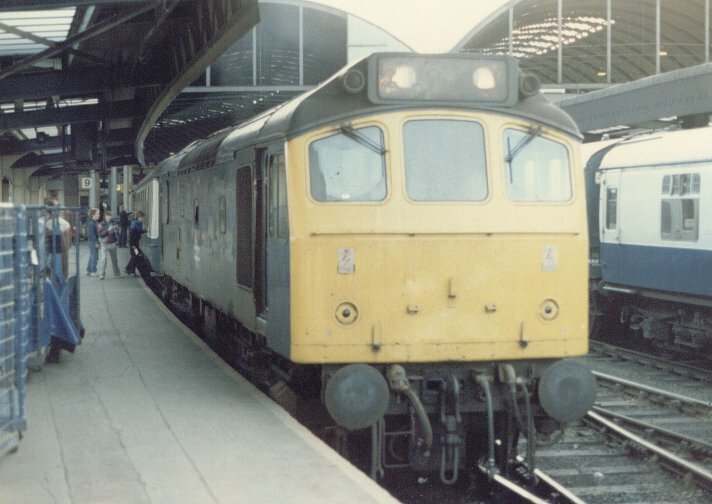 Photograph courtesy Paul Bettany 25249 (& 25313 out of sight) stand at Birmingham New Street awaiting the right away with the last Class 25 railtour, September 28th 1986. Engineering work at New Street prevented the Type 2s from running around their train here, hence they had been removed at Birmingham International with 86237 working the short hop to New Street, with the Class 25s following and regaining the train here. Photograph courtesy Ian Hammond BR's decision to have a sunset date for Class 25 hauled railtours found 25249 & 25313 reaching Derby with the 'Mersey Ratcatcher' on September 28th 1986. 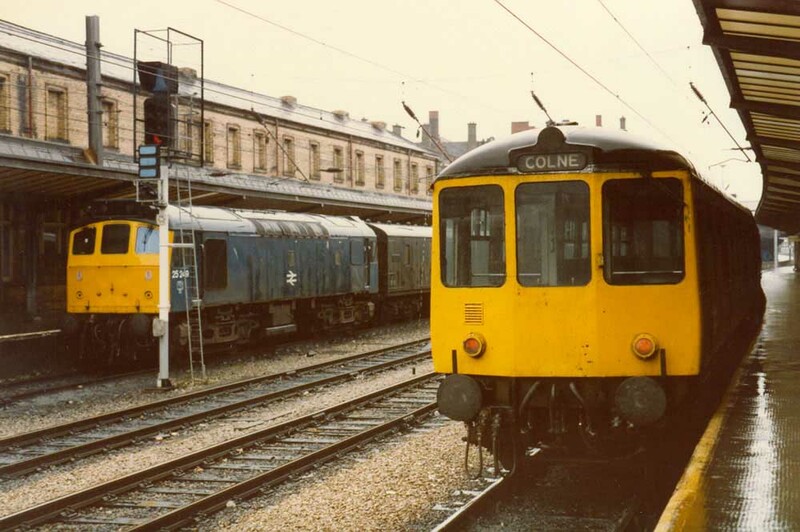 Although no more railtours would be diagrammed for Class 25s they would still continue to be utilised on passenger workings on an emergency basis due to failures or multiple unit shortages. From the publicity about the final railtour, a map of the route. Thanks to Mark Bennett for this fine piece of memorabilia. 25249 was noted at Crewe diesel depot on December 6th. 25249 was stabled at Warrington Arpley on December 31st. 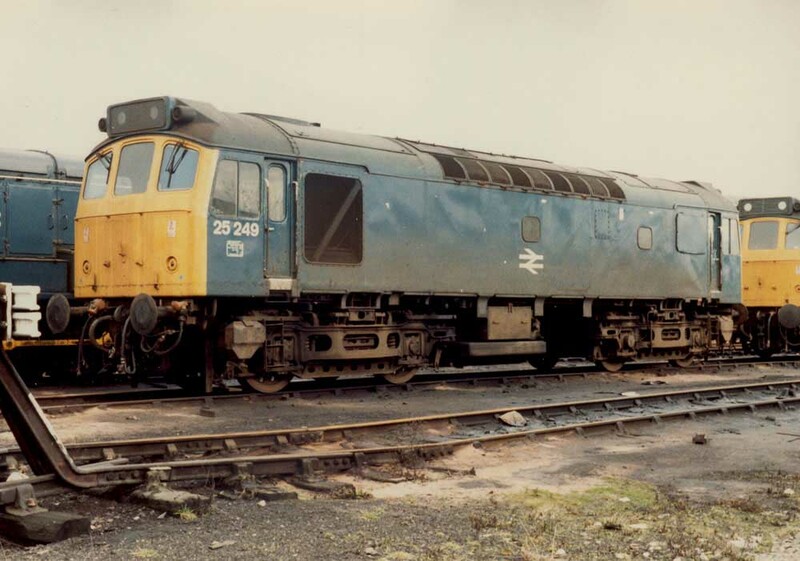 For 25249 Christmas 1986 and the New Year were spent at Crewe Diesel Depot. The locomotive had been out of traffic since the evening of December 16th awaiting a 'C' exam and exhaust system repairs. It was not until January 15th that 25249 was finally back out on the road, being noted at Workington on the evening of January 16th. On January 24th & 25th 25249 was active in the Warrington area, including jobs to Over & Wharton and Deanside. On a very cold January 26th the empty stock off the 17.28 Euston - Preston was worked by 25249 from Preston to Longsight. 25249 had arrived at Preston earlier on the 3P05 parcels working from Manchester/Bolton. On the evening of 27th the locomotive was at Derby Etches Park scheduled for the 1M38 to Crewe. After arrival at Crewe Depot investigation was made into a reported 'low power' problem. However repairs were not forthcoming with the locomotive taken out of service on January 28th. Page added May 6th 2000. Last updated Marc 3rd 2019.